Crose & Lemke Construction creates stylish, unique and distinctive living spaces for homes throughout central Iowa. Crose & Lemke specializes in remodeling, renovations and additions for both houses and condominiums. We offer a full slate of in-house construction services, including design-build, new additions, interior and exterior updates and small projects. 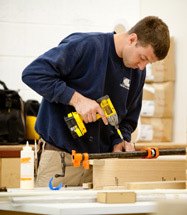 We have four primary divisions: masonry, carpentry, millwork and repairs/moisture control. Crose & Lemke's creativity and craftsmanship shines through on every project. View our past project gallery to see how we bring out the personality of each of our clients to create unforgettable living areas. We invite you to learn more about Crose & Lemke. To discuss how we can add to the value, enhance the beauty and improve the livability of your home or property, please contact us.